Oculus hopes to use the extra funds to finally start mass-producing a consumer model. 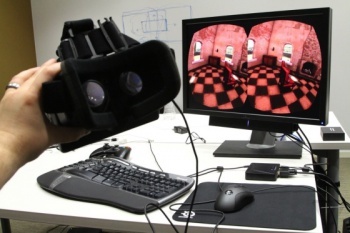 "Virtual reality has been a long standing dream in tech and sci-fi. To me it always felt kind of inevitable but it was one of those things, you never knew quite when it would become a reality," says Chris Dixon, the man who, together with Marc Andreessen and Andreessen Horowitz, are contributing to a massive $75 million investment in the Oculus Rift virtual reality headset. Oculus CEO Brendan Iribe hopes to use this money to finally get a consumer model of the headset in the hands of the public. The last time Oculus sought venture capital, they raised $16 million, an impressive figure in its own right, but is still dwarfed by this latest fundraiser. "We always knew we needed a B round [of fundraising] to get to the consumer market at volume. We didn't know the scale we needed for V1 until recently," Iribe says. In addition to going into mass production, the company wants to use the cash to help shoulder some of the burden faced by software developers choosing to take the time and money to develop games for the Rift over more traditional platforms. "They're not just betting that their game will be successful, they're also betting that Oculus will sell enough units to make their game profitable, and that's a really big bet for a developer to make," says Palmer Luckey, Oculus founder. "If a company is going to take out a lot of time from their development schedule to build a game in VR, we don't want them to have to shoulder all of that risk themselves." Oculus would not say when they planned to ship a retail version of the headset, but did announce that it has now sold 40,000 Oculus Rift developer kits, and expects to sell through 70,000 by the time it gets to the consumer market.